I wanted to honor a minor tradition of looking at Japanese words (this tradition starting with my use of Shu Ha Ri (守 破 離). They are sometimes more revealing, possibly because being outside my native language, they trigger different associations. I found “chu shin” ( 中心 ), which to my untutored eyes should mean “center of the heart”. How perfect could that be! However, my Japanese colleagues said that phrase is too ordinary, used for the center of a circle or a city. Reading further, I found that 心, which when standing on its own, is pronounced “kokoro”, and means “heart” or “spirit”. It is used by Miramoto Musashi in his Book of Five Rings when he wants to talk about the heart/spirit of swordsmanship. In other words, it’s perfect for my uses. 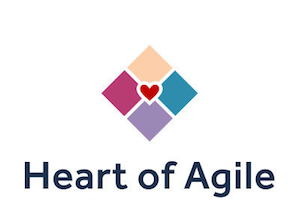 It is used with the genitive “no” ( の ), so one would write “Agile の 心” or “Agile’s heart”. The word “heart” also works in English, for heart, soul, center, spirit. Hence, heart. Kokoro extends shu – ha – ri, see Shu Ha Ri Kokoro. Another good reason for choosing it. The nice thing about these four words is that they don’t need much explanation. They don’t need much teaching. With the exception of “Reflect”, which is done all too little in our times, the other three are known by most people. You know if you’re doing them or not.